I just wanna ask, who are you ? The 1 using Windows XP and Google Chrome. I believe you are the same person from before till now. Why that link, but not http://rhythm-yun.blogspot.com ? And it doesn't seems like you are linking from another source, since it all arrived directly. Just kinda curious, why that post ? Off to KL to meet my 未来姐夫's family. Happy New Year every1, is 2010 .... 20 years old jor. And yeap, all this time, "pasb ^v". Huh ? Don't get it ? Don't worry, it is meant to be that way, haha. Ask me if you wanna know. Is Christmas, wish everyone a merry merry Christmas ! I did what i wanna do for this Christmas... yea... is good enough. Submitted my MI, abstract art... motive design is what the lecturer call them. All 3 are plain illustrator, with 0% photoshop. Astronomical > Zoo > Sport. Like always, nothing impressive, nothing special. But just post only. And yea, bogoshipo .... is truth afterall... now that you have let it go, i just have to pray hard that you can move on ... and leave all the depression behind.... it doesn't have to be me, if i am not the one..
A paper bag i design for my class assignment. Ntg special and ntg so nice about it, just sharing. Next time can ask me if you want a unique paper-bag, haha ! =.="
Saturday : Morning eat dimsum > times square daddy shopping > daddy went gathering, we all went ikea with mommy > steamboat > chit chat n rest at sis house. 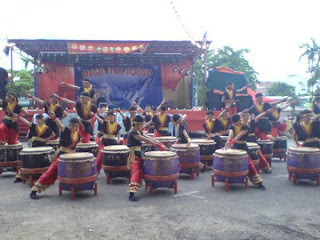 Sunday : Morning bak kuh teh > visit relatives at cheras > daddy mommy went back > went to KLPAC for hands percussion performance ! > eat and back to cyber. Among all the places we ate, there are 3 places which are recommended by ChuiLing or AhXian. So i really have 口富, haha ! 引用英文的一句 " the curtain is closing soon..."
还有贝菁回来大马了, 有机会去看看她最近如何了, 还有她的 choo choo train, 听说很高呢. 高中, 我们开始为彼此撑腰, 从学业, 友情, 舞蹈 直到感情. 通通都成了之间的话题. 为了些往事... 又事隔多年... 别说值得或不值得... 只想说, 不累吗 ? "一些问题, 逃避是解决不了的. 面对与接受来得更加洒脱." <<< 这句话很难理解吗 ? Went to a batik factory with my coursemates. Met an old friend who never met for almost 2 years. She went to Australia, so meeting her is hard afterall. It reminds me a lot of my secondary school's life. Helped some guy with tires changing too. Although i had to wait for them, sweat for abit. 社会就是这么的糟糕... 若自己无法掌控的事情, 就别去为它懊恼... 何苦呢 ? 我不会忘记为了那一件事情落泪的那一晚.... 很无助, 很彷徨, 很难看 !!! 还有大家留点言, 好吗 ? cbox 那儿说下 hi 也好, 总算我觉得不是写给墙壁看的. 痛 ! ; 漏电 ? 对啦 ! 就是这样了 ! 哈哈 ! This is the 100th post of this blog. So let it be some positive thinking post. Well, even it is not the 100th post. I would be writting positive stuff this time. Sometimes, when your vision are not that high anymore, when what you wish is something simpler. You just get to be happier easier. When what i wish is just to see her laugh and smile. Dream big, but don't be carried away. Hehe, i guess this would be just fine for me. Went out with friends to KLCC Aquaria n Petroscience today. Was fun but tiring as well. At Aquaria, we chased for the sharks, point at all the rare fishy and had a good laugh. In the end, we all end up exhausted at the end of the day. Everynight, embraced by the moonlight, a wolf will howl. A wolf's howl can be very expressive. A wolf's howl can be a sign to show how lone it is. A wolf look into the moon as it howls, just like it is trying to reach as high as the moon. If i were a wolf, will my howling reach as high as i want it to be ... ? Will my voices reach the place i seek to reach... ? 我甚至开始不明白我到底怎么了 ? 醉了吗 ? 或者盲目了 ? 不过功力, 说实在的, 维新好像就只有减无增的.... 我没其他意思... 不过以前的师兄师姐就比我那一班好多了. 看到这短片, 还真想找个机会, 趁还有一些 junior 认得我时, 去看看他们练习什么的. 不过, 一起努力, 一起练习, 一起承担, 一起开心 等等, 都是我在鼓队五年内学到的. 这是2001年的, 我姐当时才form1 or form2, 里面还有几幕看得见她. 这是我那一 badge 的. 哈哈, 我在里面呢. 或许日子久了... 都会是 "啊 ? 习惯了..."
生日时, 大家的 wish 真的非常感谢 !!! 特别是一些人的, 我更是非常感动. 倒数两天... ; omg 啦 !!! 感觉.... 就像 anime 里... 脸都蓝完了... =.="""
瞬间, 就像 anime 里... 闪雷.... o.0"""
回到家, monitor sot jor, 不过... 算了... 总算还能用... 只是 startup 时需要等几分钟..
有带电脑, 感觉好一点. 总算回到房间, 还有东西按, 有网上, 有歌听. 有私隐. Was thinking it is not going to be how good, but actually i kinda like it. The storyline is less intense, but funny. It always make us laugh when watching it. Silly yet actually packed with something within it... hehe. And WS, dun ever 4get u promised me ur 400 episode ! Without it, how i survive my holiday !!! 只是, 我觉得我会比较喜欢 '来来来, 死就死, 只要我无遗憾 ! " 最近在看 one piece, 看见有一个角色叫 chopper. 当然我有一个不可能的愿望... 不过不可能发生... 一样的, wish wish 我... 我已经很满足了. As i know, the moment i lay down. But will there be a day when it actually flows the right way ? 什么你们要 ? 一直重复 : 我们这一伙说话有点夸张, 吊人更是专家. 突然下起了大雨... 我不知道干吗的竟然和文昇说 : " 你昨晚说要打搞cat的人就在附近..."
不管会是如何,不要伤心什么的, 自己为自己加油吧 ! 哈哈 ! I never wished to become a professional photographer, though i somehow like it. 前天, 朋友约了我出去... 困扰了很久... 最后还是栽在一通电话... 我去了. 花了不少电话费在那儿: '啊~走直然后右 ? 啊 ? 右还是左边? .....'.